While there certainly have been plenty of prohibitions historically against playing cards, usually the focus was anti-gambling. There have also been laws allowing card playing, especially during certain times of the week or year and sometimes even allowing penny bets. Right from the beginning there have been those who saw cards as a popular artifact that could be used as much for moral purposes as immoral. The point that I want to make in this series of posts is that people have seen playing cards in terms of allegories that point them toward the best (or worst) ways in which to live their lives. There is something about these loose leaves that through shuffling allow ‘fate’ to herald triumph or loss that has always appealed both to the imagination and to our belief that we can be guided to a morality that will result in triumph. Those who have seen the Showtime production “The Tudors” might recognize the name Hugh Latimer. He was one of the foremost Reformation preachers in the courts of Henry VIII and Edward VI. 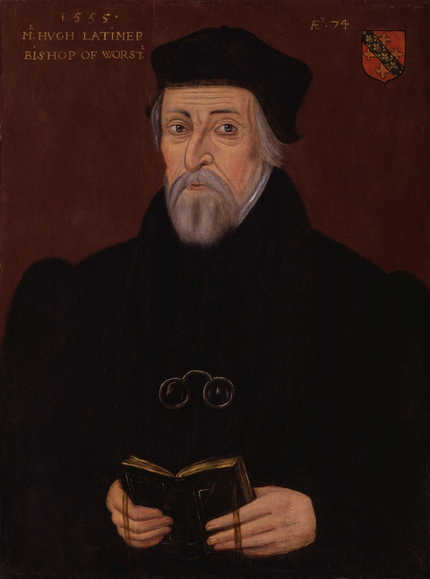 Hugh Latimer (c. 1490-1555) was said to have done more than anyone else to establish the principles of the English Reformation in the minds and hearts of the British people. His homely simplicity of style, practicality and humor made the zeal and wisdom of his sermons palatable to the masses. These sermons are still read today as a model of the craft. The statutes of St. John’s College, Cambridge, following the usual practices of the time, forbade playing with dice or cards except at Christmas (excluding underclassmen). As this popular activity would obviously draw the holiday interest of university students, Hugh Latimer used the metaphor of ‘Christ’s cards’ in a game of Triumph for his Christmas sermons in 1529. 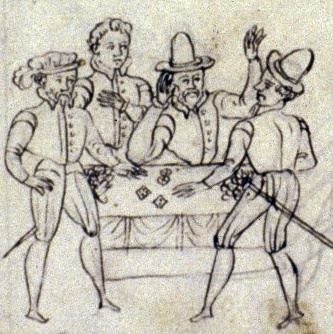 Trump or triumph was a 16th century British card-game, using a regular playing-card deck, based on earlier trick-taking games such the German Karnöffel. Their descendants include whist, hearts and bridge. Karnöffel was first described in Bavaria in 1426, and its name may have derived from the Persian Kanjifah and Indian Ganjifa, which speaks for the historical movement of playing cards from East to West (see discussion here). Karnöffel may even have been a precursor to the tarot in that certain cards, when played in particular ways, were given names: the Seven of Trump became the Devil when it was the first card played in a trick, the Six was the Pope and Two, the Kaiser. 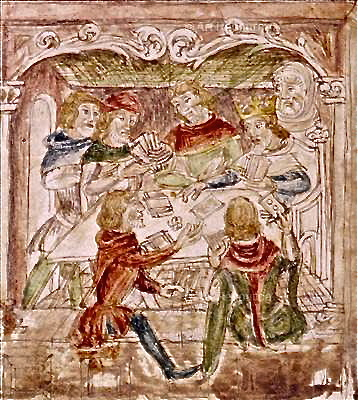 In Triumph, twelve cards were dealt to each of four players with four cards left in a stock pile (sometimes called the ‘widow’). The top card of the stock was turned up for trumps. “Now then, what is Christ’s rule? . . . And because I cannot declare Christ’s rule unto you at one time, as it ought to be done, I will apply myself according to your custom at this time of Christmas: I will, as I said, declare unto you Christ’s rule, but that shall be in Christ’s cards. And whereas you are wont to celebrate Christmas in playing at cards, I intend, by God’s grace, to deal unto you Christ’s cards, wherein you shall perceive Christ’s rule. The game that we will play at shall be called the triumph, which, if it be well played at, he that dealeth shall win; the players shall likewise win; and the standers and lookers upon shall do the same; insomuch that there is no man that is willing to play at this triumph with these cards, but they shall be all winners, and no losers. Here Latimer makes the point that as opposed to ordinary card games where there is one winner, everyone who follows Christ’s rule wins. “Let therefore every christian man and woman play at these cards, that they may have and obtain the triumph: you must mark also that the triumph must apply to fetch home unto him all the other cards, whatsoever suit they be of. Now then, take ye this first card, which must appear and be shewed unto you as followeth: you have heard what was spoken to men of the old law, “Thou shalt not kill; whosoever shall kill shall be in danger of judgment: but I say unto you” of the new law, saith Christ, “that whosoever is angry with his neighbour, shall be in danger of judgment; and whosoever shall say unto his neighbour, ‘Raca,’ that is to say, brainless,” or any other like word of rebuking, “shall be in danger of council; and whosoever shall say unto his neighbour, ‘Fool,’ shall be in danger of hell-fire.” This card was made and spoken by Christ, as appeareth in the fifth chapter of St. Matthew. “Now it must be noted, that whosoever shall play with this card, must first, before they play with it, know the strength and virtue of the same. “These evil-disposed affections and sensualities in us are always contrary to the rule of our salvation. What shall we do now or imagine to thrust down these Turks and to subdue them? It is a great ignominy and shame for a christian man to be bond and subject unto a Turk: nay, it shall not be so; we will first cast a trump in their way, and play with them at cards, who shall have the better. Let us play therefore on this fashion with this card. Whensoever it shall happen the foul passions and Turks to rise in our stomachs against our brother or neighbour, . . . we must say to ourselves, “What requireth Christ of a christian man?” Now turn up your trump, your heart (hearts is trump, as I said before), and cast your trump, your heart, on this card; and upon this card you shall learn what Christ requireth of a christian man—not to be angry, nor moved to ire against his neighbour, in mind, countenance, nor other ways, by word or deed. Then take up this card with your heart, and lay them together: that done, you have won the game of the Turk, whereby you have defaced and overcome him by true and lawful play. . . .
“Then, I say, you should understand, and know how you ought to play at this card, “Thou shalt not kill,” without any interruption of your deadly enemies the Turks; and so triumph at the last, by winning everlasting life in glory. Amen. “Now you have heard what is meant by this first card, and how you ought to play with it, I purpose again to deal unto you another card, almost of the same suit; for they be of so nigh affinity, that one cannot be well played without the other. The first card declared, that you should not kill, which might be done divers ways; as being angry with your neighbour, in mind, in countenance, in word, or deed: it declared also, how you should subdue the passions of ire, and so clear evermore yourselves from them. And whereas this first card doth kill in you these stubborn Turks of ire; this second card will not only they should be mortified in you, but that you yourselves shall cause them to be likewise mortified in your neighbour, if that your said neighbour hath been through your occasion moved unto ire, either in countenance, word, or deed. Now let us hear therefore the tenor of this card [essentially, he speaks of reconciling with thy neighbor]. . . . The moralization of the Game of Cards did not begin with Latimer but with Johannes de Friburgo (also known as Johannes von Rheinfelden) in 1377, Basil, Switzerland. This work is one of the earliest mentions of playing cards in Europe and is known as: De Moribus et Disciplina Humane Conversationis, id est ludus cartularum “Of the Manners and the Instruction of Humane Conversation, that is the game of cards” (described by E. A. Bond in The Anthenaeum, Jan, 19, 1878). 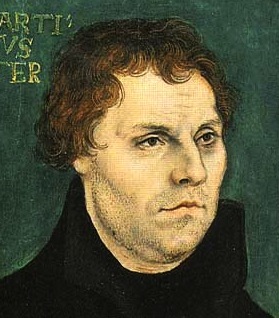 NOTE on the word “Turk”: Both Hugh Latimer in England and Martin Luther in Germany used the word “Turk” as roughly synonymous to the Devil. Today this is, of course, not considered politically correct. In the 16th century the Turks were the boogey-men that all children were taught to fear. Constantinople had fallen to the Muslim Ottoman Turks in 1453, ending the Christian Byzantine Empire. Even more recently they had temporarily captured a part of Italy, and then, in 1529, after several earlier forays, the Turks sailed up the Danube and besieged Vienna. Although they were driven out, Europeans lived for a couple of hundred years with anxiety about an impeding invasion by the Turks. A helpful summary of the Ottoman Empire and its rapid spread can be found here. This is a valuable item to post and draw attention to. There was a long history of pro-gaming comments and moralizations. This coexisted with the more understandable history of anti-gaming sentiments. These are some of the items that might be included in that pro-gaming tradition. As you know, Ross and I have argued the history of positive associations with games is necessarily the context in which a game like Tarot, with its trumps arranged like a Christian morality play, could be invented and become rapidly and widely popular. Thanks for posting Latimer’s comments. Liked how much detail, went towards – this is what was said during a sermon lecture… and the certain dates and times, a historical character would of just chimed in and said something. 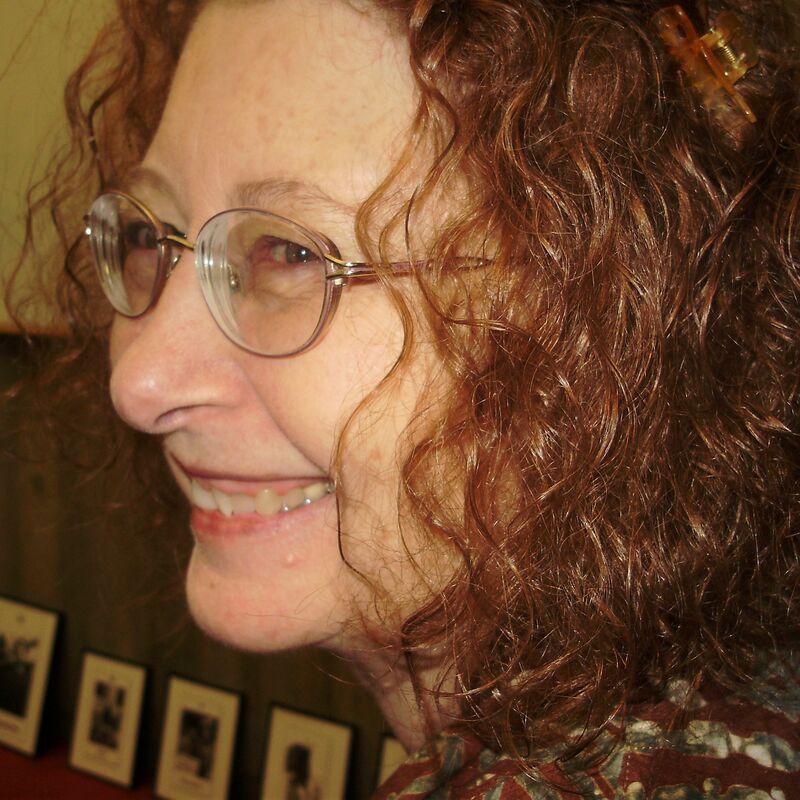 Michael – Thanks for the list. I’ll see what’s there that i want to add to the other two parts of this theme that I already have in process—with thanks to you. It seems to me that there is a kind of stream of ideas – the moral allegories, the Karnöffle titles, the ideas of fate and triumphs that leads up to a dynamic sense of the cards as, perhaps, even giving advice. Ooops – have I gone too far here?? I know, stick to the facts! card games will alws bee cool !! Very interesting stuff. It appears Latimer was doing what every good clergy should and that is to make their sermons relevant to their audience. He knew the congregation understood the game, therefore to draw tha metaphors as he did was something easily understood. It’s exactly what Jesus of Nazareth is said to have done in his own sermons and parables. It also serves to neutralize the cards and the game as neither good nor evil but benign. If they can be used for both then clearly it depends on how one uses them and the evil or the good would be inside the person, not the activity of card gaming itself. I found this blog in Latimer extremely interesting, because you have alluded to (maybe without realizing it) to Freemasonary. ” Latimer ” was know as a masonic line to follow (religious as apposed to esoteric) and ‘the widow’ in the centre of the four players is most surely masonic too. It is my belief that cards have been preserved by the masons for ‘centuries’ before becoming a ‘game’ Tony Bushby has a book out which shows the “DNA” of the cards encoded on and into mankinds DNA for us to tap into or not! Part 3 will allude to the Masonic connection – although there are no facts for this before Etteilla & Court de Gébelin. Latimer and the game of Triumphs are too early for Freemasonry and I know of no connections to the Medieval Mason’s guilds. Thanks for the reference to Tony Bushby. I am trying to keep speculation to a minimum (as much as I possibly can). I quickly looked up what I could find about Tony Bushby’s book, and I’m afraid his tarot material is full of misconceptions and ‘facts’ that have long been disproved (at least what I could learn of it). The gypsies are not from Egypt! The Book of Revelations wasn’t divided into chapters (Bushby makes much of the 22 chapters) until 1250. The concept of the Hebrew letters as made up of shadow-forms comes from Stan Tenen at the Meru Foundation (does he even acknowledge the work of Stan Tenen? ): http://www.meru.org/. If we want tarot history to be taken serious then we should at least have our facts straight!